Objective: Pruritus is a prevalent skin condition in end-stage renal disease patients. Omega-3 fatty acids have been shown to reduce pruritus in hemodialysis patients. Our objective was to assess the effect of 3 g/day omega-3 supplementation on pruritus among continuous ambulatory peritoneal dialysis (CAPD) patients. Methods: In this two-period, two-sequence crossover randomized clinical trial, 40 eligible subjects (CAPD patients who complained of pruritus for more than 8 weeks) were randomized to 3 g of omega-3 (n = 20) or identical placebo capsules (n = 20) for 4 weeks. After a wash-out period of 6 weeks, patients were crossed over to the alternate treatment option. Pruritus intensity was assessed using the visual analog scale (VAS) at baseline, 2-and 4-weeks post-intervention in each study period. Both patients and investigators were blinded to the study protocol. Findings: No significant carry-over effect was detected. The mean pruritus score (VAS) in the omega-3 group compared with placebo group after the first (−3.02 vs. −0.48, P < 0.001) and second (−4.09 vs. −0.43, P < 0.001) intervention periods showed higher significant decrease. Conclusion: In summary, omega-3 supplementation is an effective treatment for pruritus alleviation in CAPD patients. Further studies are needed to determine the mechanisms underlying antipruritic effects of omega-3. Pruritus is the most common skin condition associated with end-stage renal disease (ESRD)., The prevalence of pruritus has been reported to range between 10% and 90% in dialysis patients.,, Although improved dialysis techniques have decreased pruritus frequency, patients on chronic dialysis still suffer from this complication.,,,, The etiology of pruritus is poorly characterized; however, several factors have been implicated in its pathogenesis, including xerosis or dry skin, secondary hyperparathyroidism, elevation of plasma histamine levels and calcium-phosphorus product.,,, Pruritus in uremic patients decreases the quality of life because of sleep disturbances, depression and anxiety.,, Currently, some treatments, such as antihistamines, steroids, skin emollients, and ultraviolet B phototherapy, are used for uremic pruritus; however, none of them have been approved by the US. Food and Drug Administration. Thus, pruritus remains an important health issue in ESRD patients and it is important to explore an efficient treatment option for it. Eicosapentaenoic acid (EPA) and docosahexaenoic acid (DHA) belong to the omega-3 series of polyunsaturated fatty acids (PUFA) and are mainly found in cold water marine fishes such as salmon, tuna, mackerel, and sardines., Dietary intake of these fatty acids is necessary because of limited enzymatic conversion of α-linoleic acid to EPA and DHA. It is postulated that dietary fish intake is inadequate in dialysis patients due to the concerning lack of nutritional guidelines to encourage patients to consume fish and other seafood. Furthermore, fish oil has other benefits such as lowering blood pressure and reducing cholesterol, LDL, triglyceride amount which lowers the risk of atherosclerosis in hemodialysis patients. There have been few studies which have investigated the role of omega-3 supplementation on pruritus in dialysis patients, however, no previous clinical trial has assessed the effect of omega-3 supplementation on pruritus in continuous ambulatory peritoneal dialysis (CAPD) patients. The aim of the present pilot study was to evaluate the impact of omega-3 supplementation on pruritus in patients who are on CAPD in a double-blind crossover clinical trial. The randomized, double-blind two-period, two-sequence (2 × 2) crossover clinical trial was undertaken on enrolled ESRD patients at the Alzahra Hospital, affiliated to the Isfahan University of Medical Sciences. The study protocol was approved by the Ethical Committee of Isfahan University of Medical Sciences (Research project number: 288273) and informed consent was obtained from all patients before the start of the investigation. All adult patients (>18 years) undergoing CAPD for at least 1 month complaining of pruritus for more than 8 weeks were included in the study. Exclusion criteria included poor compliance, current pruritus treatment, skin lesions or other skin disorders, malignancy, history of malabsorption, kidney transplantation, international normalized ratio levels >1.1, parathyroid hormone (PTH) >300 pg/ml or phosphorus levels >7 mg/Dl, and hemoglobin <10 g/dL. Patients, who fulfilled inclusion criteria, were randomized into omega-3 (n = 20) or placebo (n = 20) in treatment a double-blinded manner. Patients received three 1 g-omega-3 or placebo capsules (Zahravi Pharmaceutical Company, Tabriz, Iran) per day for 1 month. After a wash-out period of 6 weeks, patients were crossed over to the alternate treatment option [Figure 1]. Pruritus intensity was assessed using the visual analog scale (VAS) ranged from 1 (no pruritus) to 10 (unbearable pruritus) at baseline, 2 and 4 weeks post intervention in each study period. Each 1-g capsule of omega-3 contained 180 mg EPA and 120 mg DHA. The shape, size, odor, taste, and color of liquid paraffin placebo capsules were identical to omega-3 capsules. All patients were treated with glucose-based solutions and exchange times varied based on dialysis adequacy. Fasting blood samples were collected before treatment initiation to assess biochemical data, including, hemoglobin, white blood cell, calcium (Ca), and phosphate (P), which were measured using an autoanalyzer (BT-3000). The serum PTH level and prothrombin time were determined by a gamma counter and the Sysmex CA 500–1500 autoanalyzer respectively. Subjects were also assessed biochemically at the end of each intervention period. Possible side effects including, nausea, stomachache, diarrhea, and bleeding were recorded at each clinic visit. Statistical analysis was conducted using SPSS (version 16, SPSS Inc., Chicago, IL, USA). Quantitative data were expressed as mean ± standard deviation, and qualitative data were presented by percentages. The normality of each distribution for quantitative data was evaluated using the Kolmogorov-Smirnov test and a Q-Q plot. Data that were not normally distributed were subjected to logarithmic transformation. Carry over effect, period effect, treatment effect (based on pruritus score difference) and time × treatment interaction all were evaluated using repeated measures analysis of variance (ANOVA). Nonnormally distributed variables (biochemical indices) were compared between groups using Mann–Whitney U test. P < 0.05 was considered statistically significant. Forty of 43 enrolled subjects completed both periods of the study [Figure 1]. As seen in [Table 1], the clinical and demographic features of the two groups were comparable except VAS score that it was significantly higher in the omega-3 group. There was no significant carry-over effect from the first-treatment period to the second (P = 0.24). 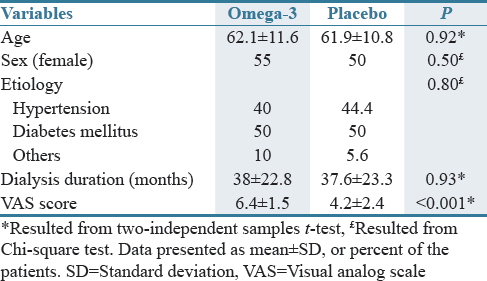 The mean pruritus score (VAS) in the omega-3 group compared with placebo group after the first (−3.02 vs. −0.48, P < 0.001) and second (−4.09 vs. −0.43, P < 0.001) intervention periods showed higher significant decrease [Table 2]. 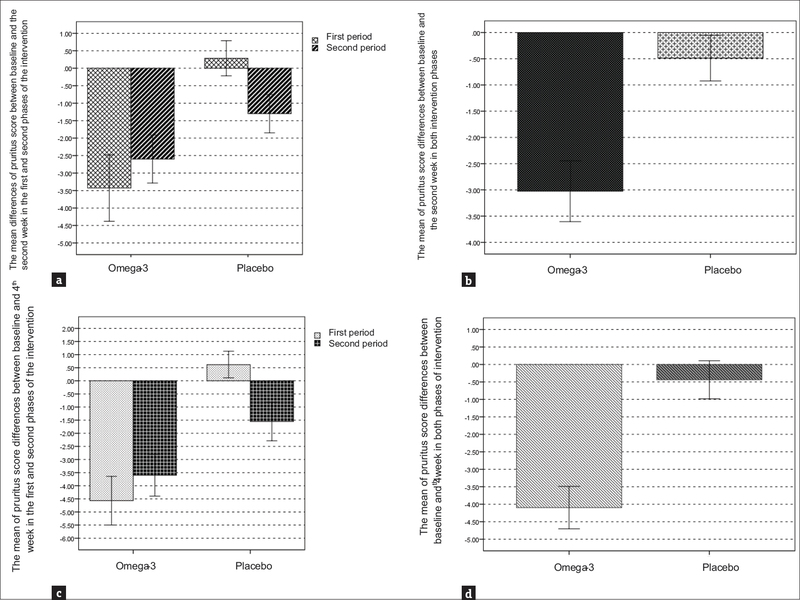 In total, the reduction in mean pruritus score after 2 weeks in the omega-3 group was significantly higher than in the placebo group [Figure 2]a and [Figure 2]b. 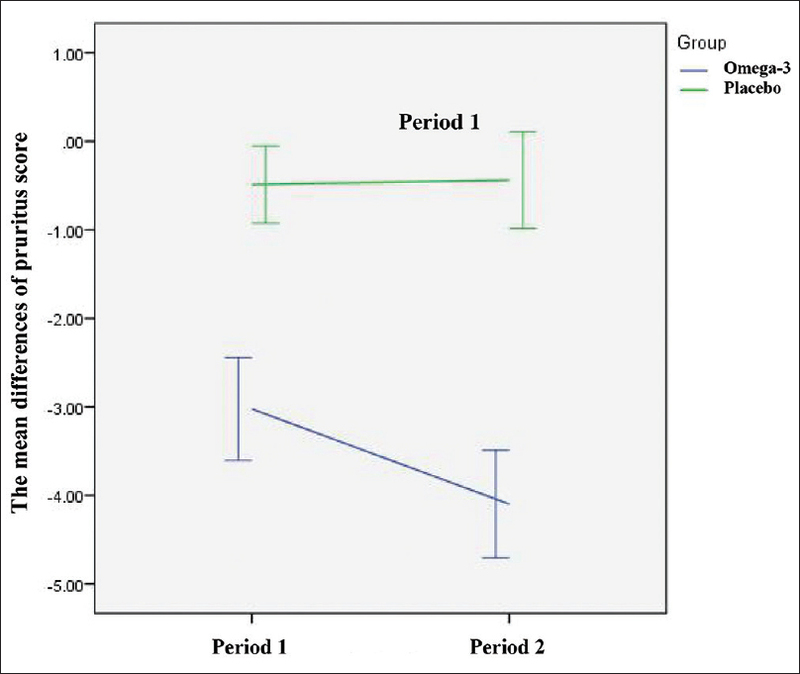 The mean pruritus score reduction in the omega-3 group was significantly higher than placebo Group 4 weeks postintervention in both treatment Periods [Figure 2]c. Overall, the mean pruritus score reduction in the omega-3 group was also significantly higher compared to the placebo group after 4 weeks [Figure 2]d. A significant time effect was observed for the omega-3 intervention on pruritus (P < 0.001) in which a significant reduction was observed in the intervention arm only [Figure 3]. Although the mean pruritus score in omega-3 intervention was significantly higher at baseline than placebo group; however, it was observed that there was a significant intervention effect, i.e., overly patients in the omega-3 group experienced more significant reduction in mean pruritus score than placebo group. In the framework of repeated measures ANOVA, the interaction of intervention × time was statistically significant (P < 0.001) [Table 2]. No significant differences were found between the two study periods concerning the overall tendencies in biochemical parameters. Pruritus is one of the most prevalent and bothersome dermatological disturbances affecting dialysis patients., Patients on dialysis present with low serum levels of omega-3 fatty acids due to low consumption of fish in the context of insufficient specific dietary recommendations on that matter. The present study investigated the effect of omega-3 supplementation on pruritus among CAPD patients in a randomized, double-blind crossover clinical trial. To our knowledge, this is the first study of this kind among CAPD patients. The results of the current study indicated that mean reduction of pruritus score in omega-3 group was significantly higher than placebo group among CAPD patients. In a crossover study by Ghanei hemodialysis patients with a history of drug resistance were treated with 3 g of fish oil for 20 days and then were switched to the placebo after a 14-day wash-out period. The results of the study also showed that pruritus in the omega-3 group decreased significantly compared to the placebo group (65% vs. 15%). Some clinical trials also examined the effect of omega-3 fatty acids on pruritus among dialysis patients in comparison to omega-6 or omega-9 fatty acids. Peck et al. examined the impact of 6 g fish oil, safflower oil and olive oil in a randomized, double-blind, prospective study on hemodialysis patients for 8 weeks. The results of the study showed that pruritus symptoms in fish oil group improved greatly in comparison to two other groups: 32.6% decrease in fish oil group compared to 15.6% decrease in olive oil and 2% increase in safflower oil group. The impact of 6 g fish oil (omega-3) and safflower oil (omega-6) were assessed on pruritus symptoms and LTB4 production (Pro-inflammatory eicosanoid) among hemodialysis patients for 16 weeks in a study which was done by Begum et al. The omega-3 concentration and omega-3/omega-6 ratio in red blood cells increased significantly in the omega-3 group. Their results also indicated that there was no a significant decrease in pruritus score and LTB4 production. However, the pruritus score in the omega-3 group decreased more than the omega-6 group: 41.3% decrease in the omega-3 group versus 10.1% in the omega-6 group. Some evidence suggests that pruritus in dialysis patients is an inflammatory systemic disease. For example, serum levels of some inflammatory biomarkers, such as C-reactive protein and IL-6 increase in patients with pruritus, suggesting the inflammatory nature of the disease. This assumption is also supports by the antipruritic effects of ultraviolet B phototherapy or calcineurin inhibitors., Recent evidence shows that omega-3 supplementation causes an increase in EPA and DHA and a decreased in omega-6 (such as arachidonic acid) plasma membrane content., It therefore appears that omega-3 exerts its antipruritic effects through competitive inhibition of arachidonic acid conversion to inflammatory biomarkers such as prostaglandin E2 and leukotriene B4. However, further in vivo and in vitro studies are required to examine this idea. It is also possible that omega-3 fatty acids create their beneficial antipruritic effects among dialysis patients through improvement in the homeostasis of skin water. The results of an animal study by Barcelos et al. have revealed that the 90-day fish oil supplementation (3 g/kg/day) reduced transepidermal water loss and improved skin hydration because of increased incorporation of omega-3 fatty acids into the skin and decreased omega-6/omega-3 ratio (<5) in acetone-induced dry skin rat models. In conclusion, the results of this pilot study indicated that omega-3 supplementation ameliorates pruritus in CAPD patients. However, results should be interpreted cautiously as the results are derived from a small sample size. Further studies are warranted to clarify underlying mechanisms as well as the optimal dose by which omega-3 decreases pruritus in ESRD patients. All authors contributed in conducting the study concept and design, acquisition of data, analysis, and interpretation of data. The authors would like to thank patients for their participation in the study. We would also like to thank Zahravi Pharmaceutical Company for their cooperation. Mathur VS, Lindberg J, Germain M, Block G, Tumlin J, Smith M, et al. A longitudinal study of uremic pruritus in hemodialysis patients. Clin J Am Soc Nephrol 2010;5:1410-9. Balaskas EV, Chu M, Uldall RP, Gupta A, Oreopoulos DG. Pruritus in continuous ambulatory peritoneal dialysis and hemodialysis patients. Perit Dial Int 1993;13 Suppl 2:S527-32. Nielsen T, Andersen KE, Kristiansen J. Pruritus and xerosis in patients with chronic renal failure. Dan Med Bull 1980;27:269-71. Merkus MP, Jager KJ, Dekker FW, de Haan RJ, Boeschoten EW, Krediet RT. Physical symptoms and quality of life in patients on chronic dialysis: Results of the netherlands cooperative study on adequacy of dialysis (NECOSAD) Nephrol Dial Transplant 1999;14:1163-70. Mingardi G, Cornalba L, Cortinovis E, Ruggiata R, Mosconi P, Apolone G. Health-related quality of life in dialysis patients. A report from an Italian study using the SF-36 health survey. DIA-QOL group. Nephrol Dial Transplant 1999;14:1503-10. Pauli-Magnus C, Mikus G, Alscher DM, Kirschner T, Nagel W, Gugeler N, et al. Naltrexone does not relieve uremic pruritus: Results of a randomized, double-blind, placebo-controlled crossover study. J Am Soc Nephrol 2000;11:514-9. Najafabadi MM, Faghihi G, Emami A, Monghad M, Moeenzadeh F, Sharif N, et al. Zinc sulfate for relief of pruritus in patients on maintenance hemodialysis. Ther Apher Dial 2012;16:142-5. Ada S, Seçkin D, Budakoğlu I, Ozdemir FN. Treatment of uremic pruritus with narrowband ultraviolet B phototherapy: An open pilot study. J Am Acad Dermatol 2005;53:149-51. Morton CA, Lafferty M, Hau C, Henderson I, Jones M, Lowe JG. Pruritus and skin hydration during dialysis. Nephrol Dial Transplant 1996;11:2031-6. Rosner MH. Cromolyn sodium: A potential therapy for uremic pruritus? Hemodial Int 2006;10:189-92. Young AW Jr., Sweeney EW, David DS, Cheigh J, Hochgelerenl EL, Sakai S, et al. Dermatologic evaluation of pruritus in patients on hemodialysis. N Y State J Med 1973;73:2670-4. Biró T, Ko MC, Bromm B, Wei ET, Bigliardi P, Siebenhaar F, et al. How best to fight that nasty itch – From new insights into the neuroimmunological, neuroendocrine, and neurophysiological bases of pruritus to novel therapeutic approaches. Exp Dermatol 2005;14:225-40. Pisoni RL, Wikström B, Elder SJ, Akizawa T, Asano Y, Keen ML, et al. Pruritus in haemodialysis patients: International results from the dialysis outcomes and practice patterns study (DOPPS). Nephrol Dial Transplant 2006;21:3495-505. Lugon JR. Uremic pruritus: A review. Hemodial Int 2005;9:180-8. Cunnane SC. Problems with essential fatty acids: Time for a new paradigm? Prog Lipid Res 2003;42:544-68. Hibbeln JR, Nieminen LR, Blasbalg TL, Riggs JA, Lands WE. Healthy intakes of n-3 and n-6 fatty acids: Estimations considering worldwide diversity. Am J Clin Nutr 2006;83:1483S-93S. Riediger ND, Othman RA, Suh M, Moghadasian MH. A systemic review of the roles of n-3 fatty acids in health and disease. J Am Diet Assoc 2009;109:668-79. Dobell E, Chan M, Williams P, Allman M. Food preferences and food habits of patients with chronic renal failure undergoing dialysis. J Am Diet Assoc 1993;93:1129-35. Friedman A, Moe S. Review of the effects of omega-3 supplementation in dialysis patients. Clin J Am Soc Nephrol 2006;1:182-92. Gatmiri SM, Mahdavi-Mazdeh M, Lessan-Pezeshki M, Abbasi M. Uremic pruritus and serum phosphorus level. Acta Med Iran 2013;51:477-81. Balk EM, Lichtenstein AH, Chung M, Kupelnick B, Chew P, Lau J. Effects of omega-3 fatty acids on serum markers of cardiovascular disease risk: A systematic review. Atherosclerosis 2006;189:19-30. Kurlandsky LE, Bennink MR, Webb PM, Ulrich PJ, Baer LJ. The absorption and effect of dietary supplementation with omega-3 fatty acids on serum leukotriene B4 in patients with cystic fibrosis. Pediatr Pulmonol 1994;18:211-7. Kimmel M, Alscher DM, Dunst R, Braun N, Machleidt C, Kiefer T, et al. The role of micro-inflammation in the pathogenesis of uraemic pruritus in haemodialysis patients. Nephrol Dial Transplant 2006;21:749-55. Keithi-Reddy SR, Patel TV, Armstrong AW, Singh AK. Uremic pruritus. Kidney Int 2007;72:373-7. Patel TS, Freedman BI, Yosipovitch G. An update on pruritus associated with CKD. Am J Kidney Dis 2007;50:11-20. Harris WS, Sands SA, Windsor SL, Ali HA, Stevens TL, Magalski A, et al. Omega-3 fatty acids in cardiac biopsies from heart transplantation patients: Correlation with erythrocytes and response to supplementation. Circulation 2004;110:1645-9. Ghanei E, Zeinali J, Borghei M, Homayouni M. Efficacy of omega-3 fatty acids supplementation in treatment of uremic pruritus in hemodialysis patients: A double-blind randomized controlled trial. Iran Red Crescent Med J 2012;14:515-22. Peck LW, Monsen ER, Ahmad S. Effect of three sources of long-chain fatty acids on the plasma fatty acid profile, plasma prostaglandin E2 concentrations, and pruritus symptoms in hemodialysis patients. Am J Clin Nutr 1996;64:210-4. Begum R, Belury MA, Burgess JR, Peck LW. Supplementation with n-3 and n-6 polyunsaturated fatty acids: Effects on lipoxygenase activity and clinical symptoms of pruritus in hemodialysis patients. J Ren Nutr 2004;14:233-41. Barcelos RC, de Mello-Sampayo C, Antoniazzi CT, Segat HJ, Silva H, Veit JC, et al. Oral supplementation with fish oil reduces dryness and pruritus in the acetone-induced dry skin rat model. J Dermatol Sci 2015;79:298-304.